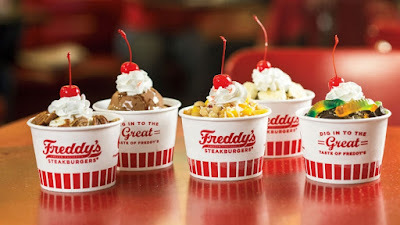 That concept of being a family -- not just a franchise system -- is central to the Freddy’s brand, according to Andrew Thengvall, VP of strategic growth. The company even calls its annual convention the Freddy’s Family Reunion. Since the restaurant’s founding by brothers Bill and Randy Simon and friend Scott Redler in 2002, that family has grown to include 60 employees at the Wichita, Kans., headquarters, and around 55 franchisees with more than 200 locations in 30 states. Although the company requires all franchisees to sign area development agreements, Thengvall explains, “we don’t ask them to open three or four restaurants a year right away.” Instead, they’re encouraged to focus on getting their first restaurant running smoothly and take their time finding just the right sites before opening their second and third units. After that, the franchisees have built up the infrastructure and capital necessary to open multiple restaurants on an annual basis. In 2016, that patient strategy evolved into a company that is now growing at a full sprint. To wit, the Freddy’s family opened a total of 59 restaurants last year and has its eyes on opening more than 70 this year.